Danielle and Bryan's wedding day was vibrant. It's the word that I keep coming back to. It truly describes the setting, the decor, and the energy throughout the day. After Danielle and Bryan said 'I do' in the church next to the Lord Jeffery Inn, their wedding party, family, and friends lined up outside the church's entrance. As they stepped out, the cheers could probably be heard across town! Rose petals flew through the air. Their dog, Tenney, led the way. And these two newly weds walked together from the church back to the inn. That energy only increased as the day went on. When Danielle and Bryan were introduced at their reception the excitement was palpable. 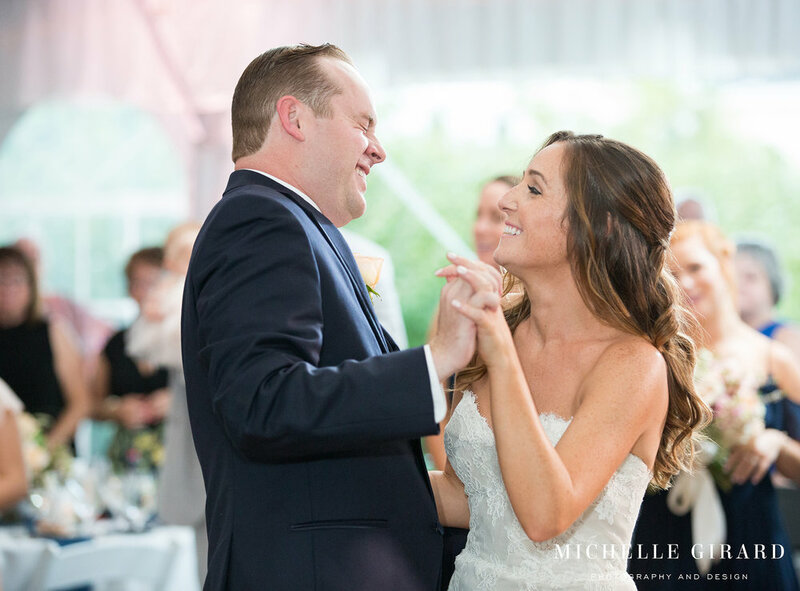 As they hit the dance floor, Bryan grabbed the microphone for a rousing game day speech that would've made Bill Belichick proud, and then they took each other's hands and went into their first dance together as husband and wife. Tenney even joined them for the last few moments of that dance as everyone in the tent laughed and clapped. As soon as dinner was over, that same dance floor was packed for the rest of the night! It was a beautiful and vibrant celebration! Florals Arrangements by Badgers Flowers & Co.